Fry bacon in a skillet til done. Remove from pan, let cool and crumble. Set aside for garnish. Melt butter and oil in the skillet. Add onion and sauté until golden. 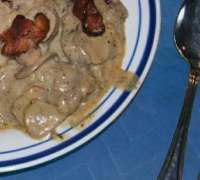 Cut chicken livers into bite size pieces. Add to the onion mixture and sauté over medium heat until tender (about 4 minutes). Add soup, herbs and freshly ground pepper. Stir to combine. Add yoghurt and stir over medium heat until warmed. Watch that it does not boil; yoghurt has a tendency to curdle. Garnish with crumbled bacon and paprika and/or pink peppercorns. Serve with toasted pumpernickle or caraway rye bread and grilled tomatoes. Quartered hard boiled eggs are also work well as a garnish. Of course, chicken livers aren't just for stew. They are also ideal in pâté!